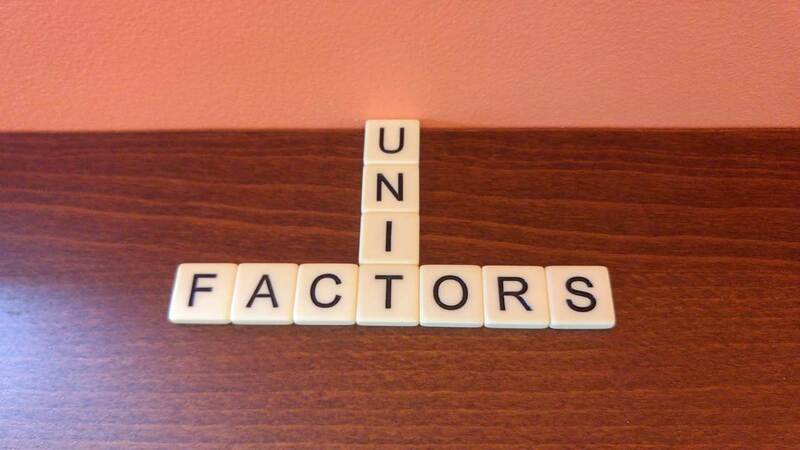 What are Unit Factors in Condominiums? Condo unit factors are used to define the portion of ownership in a condominium building or complex. They are much like ‘shares’ in a company but the company in this case is a condominium. All condos are divided up into 10000 unit factors and each owner has a certain amount of them based on the size of their portion of the common property. Unit factors are set by a developer when a condominium is built. In a conventional condominium, they are typically based on the size of the units. The larger the unit, the more unit factors an owner has. The smaller the condo unit, the less a person has. In the above example, we have 9 units in a small condo building. The total size of the building is 6540 ft2, but no matter how large or small the building is, the unit factors are always 10,000. 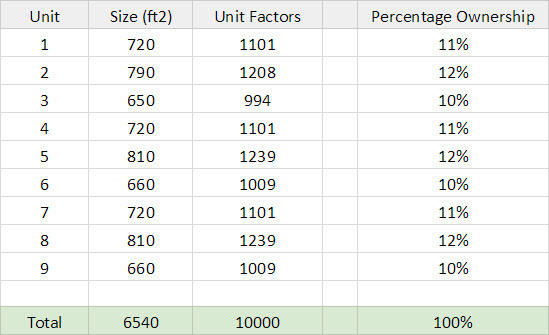 Some units have more unit factors than others because they are larger. Basically, unit factors show the percentage ownership to two decimal places. In the chart, unit 5 is 810 ft2. This means they they own 12.39% of the condo. The chart gives the percentage ownership rounded off, but it is not as accurate as the unit factor column. In the case of bare land condominiums, the unit factors should be determined by the size of the lot, and not by the size of the unit. Bare land condominiums are a little differently defined than conventional condominiums, but the concept is the same. If you own more of the complex, then you will have a larger unit factor and hence a larger percentage of the complex. Unit factors matter a lot to a condominium owner. Since they determine how much of the common property is owned, they also determine how much the owner needs to pay for the condominium complex or building. That is, the more unit factors, the higher the condo fees and any special assessments will be. If you own a condo with 1236 unit factors, then you are responsible for 12.36% of the yearly condo fees. If the condo needs to take in $65,000 per year, then you will be charged $65,000 x 0.1236 = $8034.00 per year. That is $669.50 per month for that unit. Besides the monthly cost of condo fees, another important thing with unit factors is that they do determine your voting power in a special resolution. The more factors you own, the more control you have over the future of your complex. Hi Taylor. Unit factors add up to 10,000 because that is simply 100.00% of the building or complex. So if a unit has 384 unit factors, it is the same as it owning 3.84% of the common property. We don’t need more decimal places than two because it wouldn’t be more helpful in calculating condo fees or determining special resolution votes. There aren’t enough units in any condo to need to be more specific. Hi Alan. There are condos in AB whose Boards appear to have arbitrarily increased unit factors in a building (a later phase) to be ‘more fair’ to units in previously constructed/other buildings on the Plan who have similar area/sq mtrs. Should the Plan be amended by a Court, or can Boards make a decision to levy Special Assessments or assess contributions based on their decision to apply unit factors that are different from the Plan, by simply saying so? I believe all changes to unit factors would require a special resolution where 75% of all unit owners would have to agree to any of the changes. If this did not happen, I believe the adjustment to unit factors would not be legal. However, if the new units being built are changing the percentage ownership of the complex, there may be pre-existing arrangements for this particular shift in unit factors. Without knowing more, I wouldn’t know if this was arranged or is even possible. Regardless, the plan does need to be changed and so do all the titles. For example: if a land title says there are 112 unit factors for a unit, that is how many there are. You cannot ‘decide’ to change unit factors without amending the plan as a whole and the titles for all of the affected units. This is my understanding, but this question would be better answered by someone at land titles and with help from a lawyer. My condo complex will consist of two buildings when complete, only the first building is occupied. The second building has not started construction. If the total complex will consist of 10,000 unit factors and 7,500 unit factors are needed to change condo bylaws, can the current board change the bylaws with only 5,067 of actual completed unit factors? That is an excellent question. I believe 7500 unit factors would be needed no matter what. That is, if you are saying that you only have 5067 factors complete, that suggests that the developer still has control of 4933 unit factors. This would mean that the owners cannot pass a special resolution under any circumstances. You would have to wait until the rest of the unit factors are sold off to other buyers and then you could put together a special resolution proposal and put it to a vote.